Teeth imperfections may cause many people to hide their smiles. Whether cracks, chips, stains or other issues affect an individual’s teeth, a dental professional at Overland Park Dental can easily address those issues. 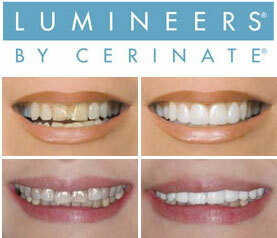 If you’re looking to regain confidence through your smile, Lumineers are noninvasive veneers that make for great looking teeth. Our patients tell us there are many things they like about Lumineers. Here are just a few of the biggest benefits. Made from thin porcelain, each veneer goes over the already existing. As a result, these versatile veneers can correct numerous imperfections. Teeth can be reshaped, tooth size altered, and the veneers themselves can cover discoloration with a new, natural-looking surface. No grinding or drilling of the teeth is necessary. Lumineers are simply laid on top of the bad teeth and cover them up. In addition to versatility, Lumineers also have durability. These veneers can last decades when cared for properly. You can eat your favorite foods with confidence and not worry about your teeth at all. If you grind your teeth, you may need to wear a mouth guard at night to prevent damage just as you would with your original teeth. Hesitation about the application procedure may arise, but individuals may rest assured knowing that the Lumineers application takes place without painful drilling or grinding-down of teeth. In addition, numbing shots are not necessary. A mold is taken of the teeth to ensure correct fit, and at Overland Park Dental, temporary veneers are applied so individuals can already begin enjoying their new smiles before the permanent veneers are bonded to the teeth. Permanent changes are always a little scary, but with Lumineers, you don’t have to worry. If you ever change your mind after having the procedure, your natural teeth are still underneath unharmed. You could go back to your natural teeth because they are still intact. We have yet to see a patient want to go back, however. No one should feel the need to hide a smile due to teeth insecurities, and Lumineers can help bring back that confidence. The team at Overland Park Dentistry is here to answer any questions that you may have about Lumineers. Just give us a call at (913) 647-8700 for our South Overland Park office and (913) 341-2380 for our North Overland Park office and we’ll be glad to answer all of your questions.